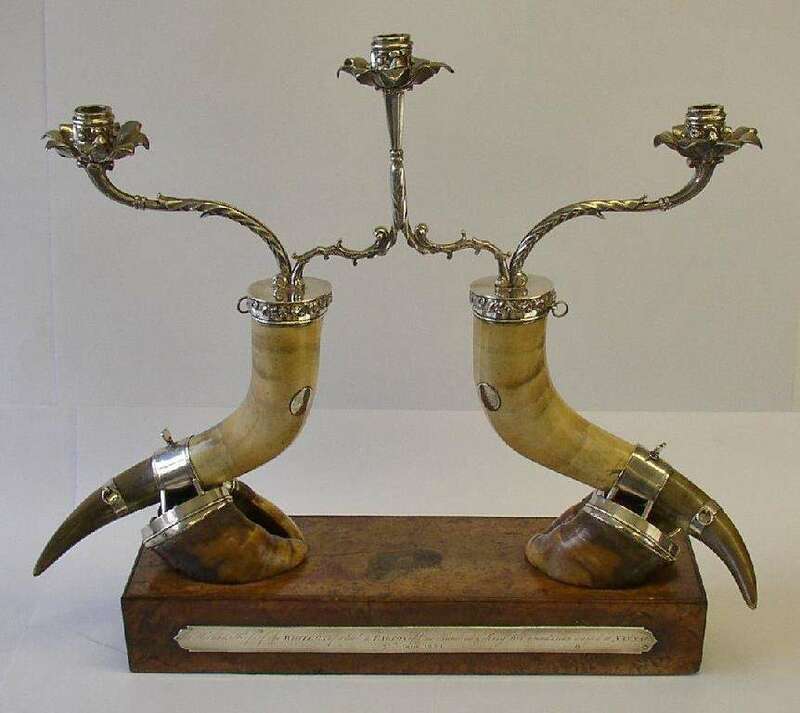 The White Ox Candelabra The horns and hoofs mounted in silver, raised on pollard-oak rectangular plinth, the horns detachable for use as drinking vessels, each bearing a circular silver shield, one inscribed R.W.V June 25th 1824, the other engraved with the arms of Vaughan impaling Mostyn, hallmarked London 1824, maker’s mark C.R, the ornate cast three branch candelabra by Joseph Cradock & William Ker Reid, hallmarked London 1825, weight of candelabra 65 oz, the pollard-oak plinth with a silver plaque each side, one inscribed, in Welsh, the other in English, overall height of trophy 23.75 inches, overall width 26.5 inches. Cyrn ac Ewingarn yr Ych Gwyn Or hwny Rhostiwyd (y Barwn ddryll) yn Pwyso Cant a chwech ugain a phump Yn Nannau Mehefin 25in 1824. The Horns & Hoofs of the WHITE OX of which a BARRON of One Hundred & Sixty Five Pounds was roasted at NANNAU 25th June 1824. Gordon Edington. The Clowes Family of Chester Sporting Artists – A Visit to Nannau, Pages 12-13, Grosvenor Museum, Chester 1985. Exhibited, Grosvenor Museum, Chester, 1985, No. 23. With regard to “White Welsh” (cattle) certainly “wild kine” survived and were hunted in the Welsh hills during the reign of Elizabeth the First. 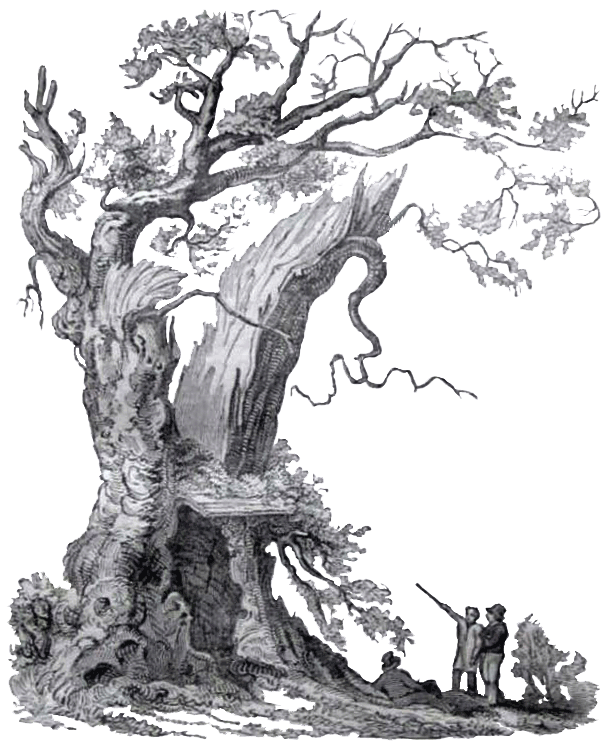 A herd was maintained on the Nannau Estate, near Dolgellau, the last animal being slaughtered in June 1824 for the coming of age of Sir Robert Vaughan’s only son. Ash, Timothy. Parc Fferm Gorllewin Cymru, (West Wales Farm Park) Blaenbedw Isaf, Plwmp, Nr. Llandysul, Dyfed. Nannau Schedule of Contents 1958, No.59.